Dr. Toy -- Stevanne Auerbach, PhD -- has been for many years one of the nation's and world's leading experts on play, toys, and childrens' Products. With over 30 years of experience, Dr. Auerbach includes educationally-oriented, developmental and skill-building Products from the best large and small companies in her annual award programs. Many parents, teachers and toy buyers refer to Dr. Toy's Guide and rely upon Dr. Toy's guidance in making the best selections among toys and childrens's Products for learning, play and fun. Dr. Toy has written 15 books (3 books on toys) and many dozens of articles about play and toys for national and regional magazines and newspapers, has been featured as an expert in articles by others, and a featured guest on radio and television programs throughout the country and outside of the USA. An unique guide to play and child development is now also available at Amazon, Barnes and Noble, and other book and toy stores. Dr. Toy's Smart Play/Smart Toys: How to Select and Use the Best Toys & Games is in a newly enlarged and improved 4th Edition, Regent Press (3rd Edition: ICR/Ingram/Lightening Source; 2nd Edition: Educational Insights; 1st Edition: St. Martin's Press). The book is also published internationally, in so far 12 countries. Her book, Toys for a Lifetime (FAO Schwarz/Rizzoli) focuses on classic toys and toys for the future. Her classic book, The Toy Chest, covers the evaluation and history of children's Products. Dr. Auerbach in 1986 founded and served as director of the San Francisco International Toy Museum, the world's first interactive toy museum. More than 50,000 children visited the museum between 1986 and 1990, when the Loma Prieta earthquake forced it to shut its doors. New toys and Products, as well as historical collectibles, were a mainstay of this unique "hands on" museum. Dr. Auerbach, an established speaker, consultant, and author, is trained in child psychology, education, special education, and child development. Dr. Auerbach has a well-earned title, "Dr. Toy", dating to her first assignment with "Creative Playthings" (1968) where she developed its first education marketing program. She approved the first grant for the Children's Television Workshop, "Sesame Street", when she worked for the Commissioner of Education, where she reviewed reading programs throughout the country. She established the first child care center for the children of federal employees, which has served for the last 30 years as the model for the entire federal government. She planned and developed a national $2.5 million R&D program in child care for the Office of Economic Opportunity, Office of the President. Before working for the federal government, Dr. Auerbach was a teacher and reading specialist in New York, Maryland, and Washington, DC. She was associated with Arena Stage Living Stage program bringing theatre skills to the classroom. Dr. Auerbach has been a member of the National Association for the Education of Young Children (NAEYC), the largest professional organization in early childhood education for more than 25 years, and is a regular speaker at its annual conference and other professional and parent organizations. She is a member of ASJA, Author's Guild, ASTRA, ACA, IPA, ITRA, OMEP, TASP, TIA, and WIT. 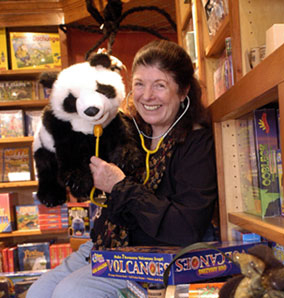 Dr. Toy is available for interviews, presentations and in-store book signings (toys, books, children's Products, teacher and children's museum stores).